Well-renowned children’s authors Morris Gleitzman, Gregg Dreise, Kris Sheather … and lil ole me, Karen Tyrrell taught children how to unlock their imaginations. Kids and teachers from Logan and Ipswich schools attended the Meanjin Writers’ Camp at USQ at Springfield campus on Thursday 19th October. I’m a Superhero author, writing empowering Superhero books, so it was only natural that I chose to teach: Create a Superhero story. I’m a passionate writing workshop presenter and interactive story teller wearing fun costumes. How was I chosen for the Meanjin Writers Camp? Someone recommended me to ALEA as a presenter and I will be forever grateful to them. 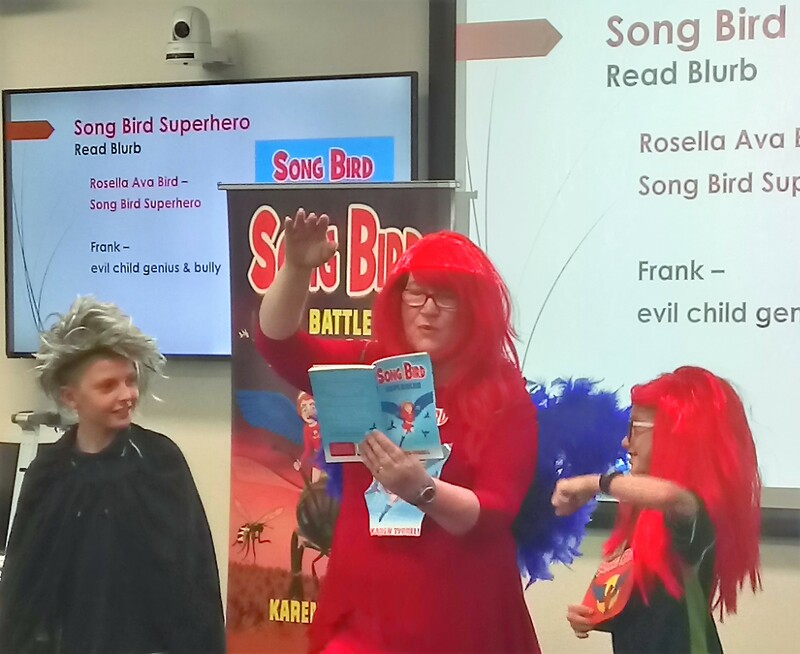 Song Bird Superhero (Song Bird 1), The Battle of Bug World (Song Bird 2), STOP the Bully, Bailey Beats the Blah, Harry Helps Grandpa Remember, Super Space Kids series ignite imagination and positive self-esteem. 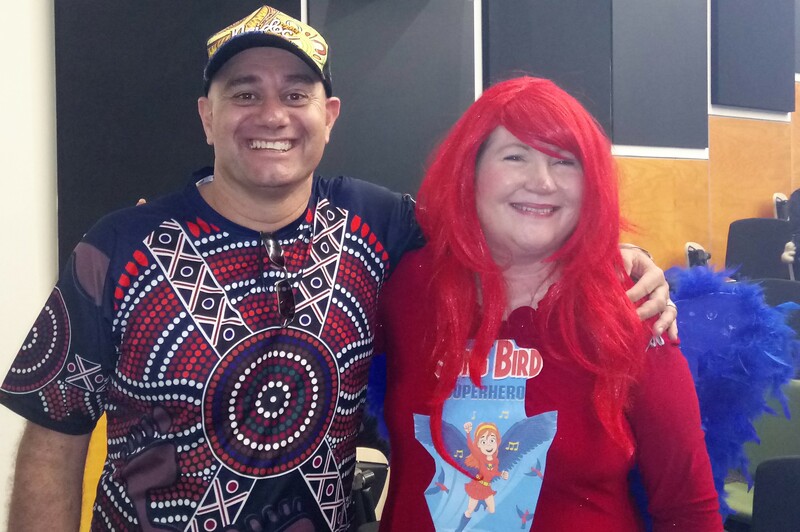 How did I present my Superhero writing workshop at Meanjin Writers Camp? 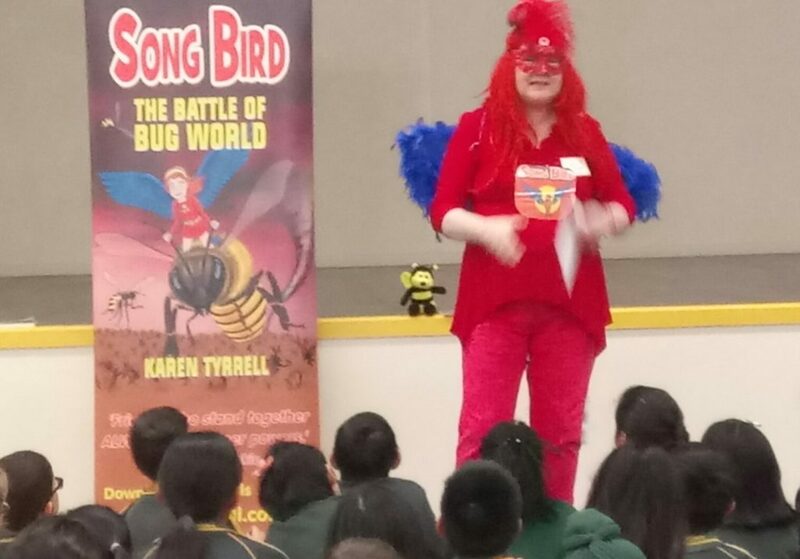 Wearing my red and blue Song Bird Superhero costume, I taught kids how to create a superhero story with SUPER powers and SUPER villains. Using superhero posters, slides and story starters I posed questions, to jump start children’s creativity. 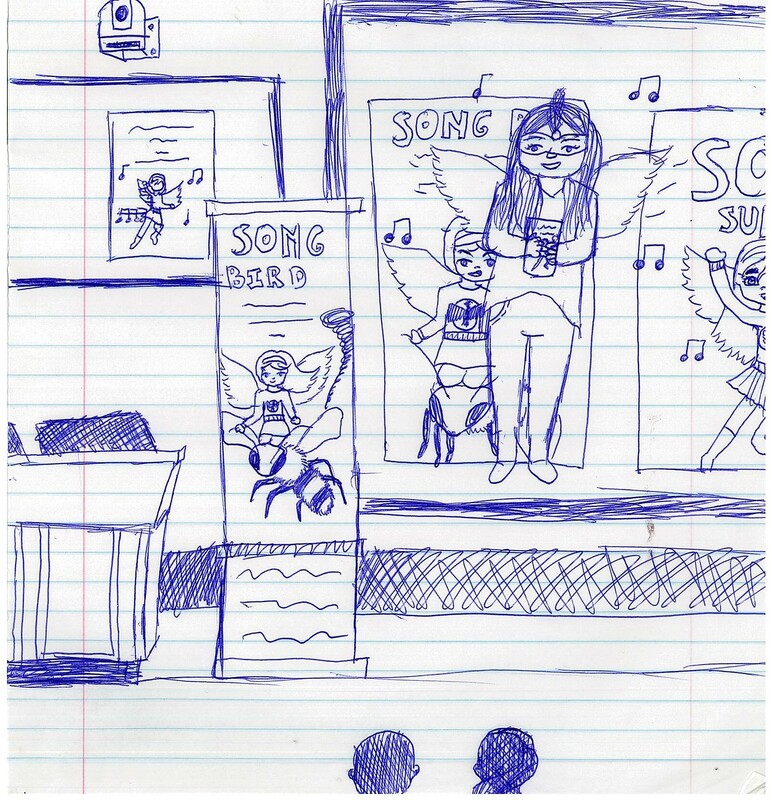 Kids dressed up as characters from my book, Song Bird Superhero rehearsing dialogue in a play. Step-by-step I guided children through the writing process focusing on characters, worlds and problem solving. What did the authors present at Meanjin Writers Camp? Morris Gleitzman – Keynote author, shared his secrets on writing funny, moving books. 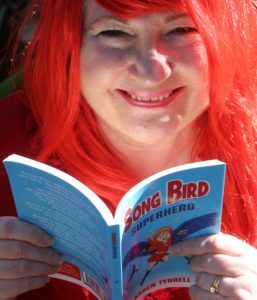 I will present four Superhero Writing Workshops at Brisbane City Libraries very soon. Please stay tuned for dates and locations. All children at these FREE workshops will receive a double-sided Song Bird Superhero bookmark and a story starter kit. I’m gobsmacked by these awesome opportunities … Thank you universe!! How do YOU present Writing Workshops for children? What tips would you like to share? Please comment, LIKE, Tweet, and Google plus. Thanks for checking out my Blog n the writers camp. I don’t know who enjoyed themselves the MOST today! The kids, the teachers or the authors?? I’ve dreamed of the day when I could present my workshops at Meanjin Writers Camp… and now this dream has come true. I can’t wait to present four Superhero Writing Workshops at Brisbane City Libraries soon. What a wonderful experience, Karen, for the authors and the children. I used to attend the Meanjin Writing Camps as a teacher/leader during the 80s. They were weekend camps at Mt Tamborine. They were marvellous fun and inspirational, just as you describe your day. I’m delighted to see that two of my special interviewees (you and Gregg) were both presenting on that day. I met Morris Gleitzman years ago at a book signing for Two Weeks with the Queen. (It’s probably more truthful to say – attended the book signing). Imagine how many fans you’ll get to meet over the next thirty years! Congratulations, Karen, I’ve popped in here from FB where I read the amazing letter from a school principal in response to your talk. Brilliant work. If that was all you ever achieved, it would be enough. But you do much more and touch many more lives. Wonderful work. WOW! Thanks Norah for reading the letter from the school who attended my writing camp … and coming over here to comment. Thanks for sharing your experiences with Morris Gleitzman and Gregg Driese … and for believing in me as an author too.